About Lord Muruga: Though Lord Muruga is worshipped all over India in several names, it is in the natha and siddhar paths that He is given the primal importance as the master of all masters. He is the extreme powerful transforming energy and the wisdom that is beyond enlightenment. Several Sages have attained becoming one with Light while in the physical body by worshiping Him. He is the journey beyond enlightenment! Born through the third eye (the focus of meditative energies to manifest reality) of Lord Siva, Lord Muruga is of the six dimensions. Lord Muruga is depicted as in the six pointed star- representing the awakened kundalini. 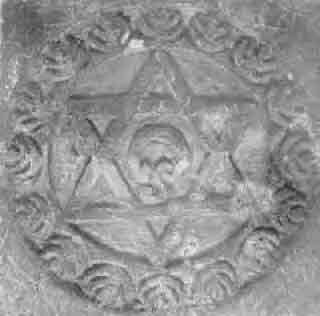 It is this dimension of the six pointed star as the powerful form of His geometrical representation that was later was taken out of South India by Jewish traders to become the star of David and the key to the kabala tradition. The inner knowing of the vision depicting Lord Muruga and his two wives is- Vali, the Goddess representing Earth as the awakened kundalini fire- Ida (the moon energy- the reflective mind) and the Deviyani, the Goddess representing Heaven as the awakened kundalini fire- Pingala (the sun energy- the mind that is absorbed to be Source). Lord Muruga is the golden kundalini stalk, ‘the Vel’, that arises as the center, in the middle of the Ida and the Pingala. To witness in person the awakening of kundalini and the presence of Lord Muruga, take a pilgrimage to anyone of Lord Muruga’s shrines and observe, pray and seek the grace of the countless pilgrims who dance in the awakening joys as they climb up to worship Lord Muruga! Vetri Vel Muruga- Victorious Awakening Presence! Hail Skanda! Vanquisher of the mighty foes! Praise be to the Invisible Lord He who abides in the hearts of devotees true! Praise be to the six-faced one! Praise be to the Son of the Three-Eyed Siva! Praise be to the Lord Supreme! Praise be to the golden-hued one! Hail to the Son of the starry maids! Hail to the rider on the peacock! Hail to the Lord with the twelve hands! Hail to the Lord with the twelve eyes! Hail to the wielder of the Lance! Praise be to the destroyer of the Asuras! Praise be to the slayar of Tarakasuran! Praise be to the Victor of the Asuric forces! Praise be to the Lord of felicity! Praise be to the Lord of bliss! (Suralangasya Rakshithre Namaha); Hail Saviour of the Devas! Hail Commander of the Heavenly hosts! Lover of devout ones, Praise be to Thee! Son of Uma Praise be to Thee! Mighty Lord Praise be to Thee! Eternal youth Praise be to Thee! He who reft asunder the Kraunca Mount Praise be to Thee! Praise be to the Army Chief! To the effulgence of Fire, all Hail! To Him who shone on the astral Visakha All Hail! Thou Son of Sankara All Hail! Thou Preceptor of Siva All Hail! On Lord, God Almighty, All Hail! Oh Lord eternal, Praise be to Thee! Thou potent Lord, Praise be to Thee! Unsullied by arrows art Thou Praise be to Thee! Thou beloved of Parvati, Praise be to Thee! Oh, son of Goddess Ganga Praise be to Thee! Thou who did’st nestle in the Saravana Lake! Thou who art born of Fire! Energy Art Thou Praise be to Thee! Praise be to thee Auspicious One! (Blissful)! Praise be to the Invincible One! Praise be to the Lord extolled by Brahma! The one Word art Thou All Hail! In Two Art Thou All Hail! Thou Art the Three All Hail! Thou Stealer of pure hearts All Hail! In four Art Thou All Hail! In five letters Art Thou All Hail! Father of all Creation All Hail! Praise be to Thee, Oh Peerless One! Thou who dost sustain the fire! Hail Thou who arose out of the Vanni flame! (Fire of the Suma tree)! Thou glory of the Absolute Paramasivam, All Hail! Oh, Subduer of the foes of the Devas, All Hail! Thou resplendent One, All Hail! Thou Auspicious One All Hail! Thou Oh Splendour of the Vasus (a class of Gods) All Hail! Praise be to Thee, Oh lover of celibacy! Thou Luminous Sun All Hail! Thou Effulgence divine, All Hail! Thou Omniscient One All Hail! Thou Radiance of the Moon Praise be to Thee! Thou who adorns the crescent Praise be to Thee! Engergy art Thou Praise be to Thee! Great Artist of Deception too art Thou, Praise be to Thee! Everlasting joy of attainment Praise be to Thee! Source of all Existence All Hail! Oh, Supreme Splendour, All Hail! Savior of all ills All Hail! Thou Transcendant One, Praise be to Thee! The Source of the Vedas art Thou, Praise be to Thee! Immanent Art Thou in the Universe, Praise be to Thee! Praise be to the Lord of Valli, the Vedda belle! Praise be to Him who showers grace on those who seek his solace! Praise be to Him who annihilates those who steal! Praise be Thine whose forms are endless! Praise be Thine, Oh Thou infinite Bliss! Praise be Thine, Thou Lord of peacock banner! Praise be Thine, Oh lover of gay exuberance! Praise be Thine, Thou lover of supreme exuberance! Praise be Thine, Oh Lord of lofty magnificence! Thou who art the culmination of righteousness All Hail (Dharma)! Thou who deigned embodiment for a cause All Hail! Thou Ambrosia of Life All Hail! Thou life of life, Praise unto Thee! Thou support of all beings Praise unto Thee! Praise unto Thee who subjugates all hostile forces! Thou vanquisher of heroic opponents, Praise unto Thee! Thou art Love, and of crimson beauty Praise unto Thee! Oh Consummation of glory, All Praise to Thee! We praise Thee, Oh effulgent Radiance! Oh Supreme (Sovereign) Goodness, Praise unto Thee! We praise Thee, luminous wisdom serene! Thou who art beloved of seers Praise unto Thee! Oh universal Teacher, All Praise to Thee! We praise Thee, Indweller in the core of our hearts! We praise Thee, Oh bestower of indestructible results ineffable! We praise Thee, most glorious effulgent Radiance! Palani near Madurai enshrines Dhandayutapani in a hill temple. At the foot of the hill is Tiru Aavinankudi. Siddhar Bhoganathar’s samadhi is next to the sanctom sanctorum. Tirupparamkunram near Madurai enshrines Subramanya celebrating his marriage with Devasena the daughter of Indra. The shrine to Shiva here has been revered by the Tevaram hymns of the Nayanmars. Pazhamudircholai near Alagar Koyil near Madurai is a simple shrine on the Pazhamudircholai hill enshrining Skanda. Swamimalai in the Chola Kingdom enshrines Swaminathan in a temple built on an artificial mound accessed through a flight of 60 steps symbolizing the 60 years that constitute the cycle of years in the Indian calendar. It was here that Lord Muruga revealed the meaning of “OM” to his father Siva. Tiruchendur enshrines Subramanyar and Senthilandavar in a vast temple with a lofty gopuram visible for miles, on the shores of the ocean in Southern Tamilnadu. Tiruttani near Tirupati and Chennai enshrines Subramanya in a hill temple accessed through a flight of 365 steps. It represents the site of Skanda’s marriage with Valli.